Oh the adorable things that you need for your pregnancy! Oh the cute things that you can find at www.pinkoliveboutique.com! Stationery, journals, baby stuff and even clothing... it just doesn't stop! The Pink Olive Boutique is THE PLACE for you! We LOVE The Belly Book! It's a nine-month journal for you and your growing belly"! Before you actually get to meet your baby, you spend a swell nine months getting much better acquainted with your growing belly. the first pregnancy journal devoted 100% to you and your belly. 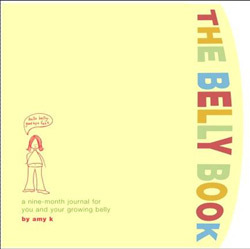 The Belly Book is organized by trimester and includes pages for "time lapse" belly photos and ultrasound images, as well as prompts for writing about morning sickness, food cravings, maternity clothes you never want to see again, plus much more. Just what our LAPregnancy Bellies need for their Belly!